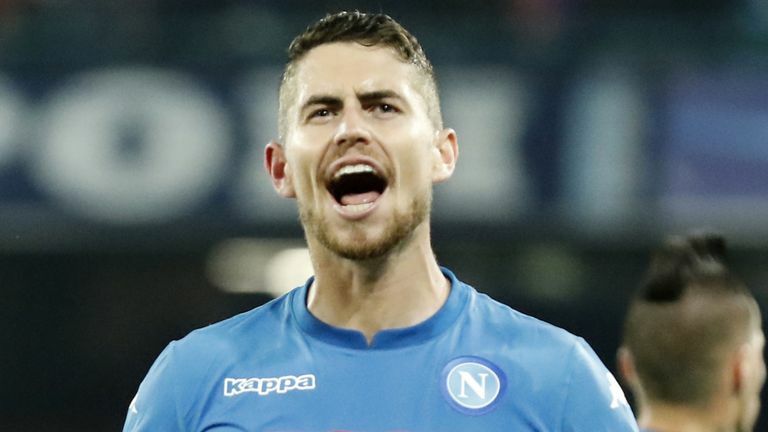 Napoli have rejected a bid totalling £44m from Manchester City for Jorginho, according to the Italian club's president Aurelio De Laurentiis. De Laurentiis told Corriere dello Sport on Saturday that City had made an offer of £40m for the Italy midfielder with bonuses on top. Sky Sports News understands City are in advanced talks over a deal for the 26-year-old, but are yet to make a formal bid. "I've refused €45m plus a €5m bonus from City for Jorginho," De Laurentiis said. Jorginho has two years left on his current deal with the Serie A side. Agent Joao Santos previously said a move to the Premier League for his client, who has also been linked with Chelsea, was on the cards this summer if financial terms could be agreed. Jorginho has played his entire career in Italy, having moved to Europe from Brazil as a youngster. He joined Napoli in January 2014 and, after expressing his desire to play internationally for Italy, has won six senior caps. De Laurentiis is also looking to add to Napoli's squad, which will be under the management of Carlo Ancelotti next season, while admitting Marek Hamsik could be on his way to China. Shandon Luneng are understood to be interested in the 30-year-old Slovakia midfielder. "He wants to keep 80 per cent of the current group. He thinks it's excellent. Our aims are a goalkeeper, a full-back, a midfielder and a winger," he added. "If Hamsik wants to go to China, we won't stop him, but how much will they give?"